Oscillating water column wave energy converters (OWC-WECs) are being investigated by many researchers in the group. This project looks at how control engineering techniques can be used to increase the energy yield of such a device. An oscillating water column wave energy converter is a device wherein a column of water is able to move within a chamber whose base is open to the sea and where the top of the column has air trapped above it. As the surface of the column of water moves, the air is forced in and out through a turbine. First a generic OWC-WEC was modelled in the time domain. This OWC is assumed to be the central chamber of a breakwater-mounted OWC array. 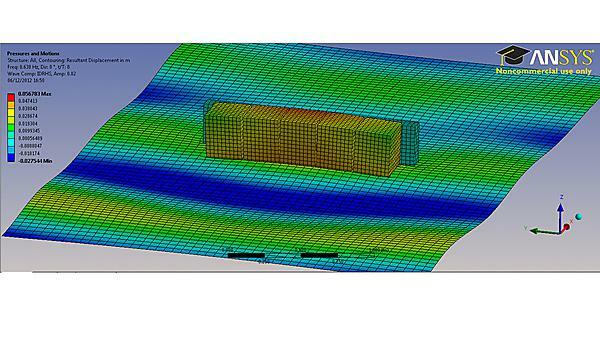 The water column was modelled as a block of fixed sized using the hydrodynamic software ANSYS™ AQWA®. Its response was taken into the time-domain and combined with thermodynamic equations to model the chamber and the turbine. Numerical analysis was then undertaken in MATLAB® Simulink and a controller using fuzzy logic tested to determine its net energy conversion. Control means looking at ways of changing the amount of energy taken out of the waves at any moment so as to increase the amount of energy extracted over time. The fuzzy logic controller changes the turbine speed.